Why did pharmaceuticals release hair loss drugs in tablet form? Why have Korean pharmaceutical companies released hair loss treatments in tablets instead of soft gelatine capsules? Dong-A ST, JW Pharmaceutical, and Hyundai Pharm recently rolled out tablets of generic copies of GSK’s Avodart (dutasteride), a treatment for enlarged prostate and hair loss. Avodart and MSD’s Propecia (finasteride) are two major treatments for hair loss in the domestic market. After Avodart’s substance patent expired in 2016, generic copies came out on the market in soft capsules, just like the original. However, local drugmakers recently changed the form to tablets. Dong-A ST’s Dutavan Plus, JW Pharmaceutical’s Jdart, and Hyundai Pharm’s Damodar are all newly released tablets. The three companies said they chose the tablet form to make the treatment “patient-friendly,” officials said. While soft gel capsules could be stuck in the mouth or esophagus, smaller and film-coated tablets make it easier to swallow. Also, the deformation of a soft gel capsule could affect the absorption of the drug, but tablets are free from such risk. Tablets have advantages in the distribution process, too. While soft capsules could rupture and leak the medicine, tablets rarely rupture even in high temperature, officials said. However, GSK emphasized that Avodart is different from other soft capsules. “Dutasteride has a large molecular weight and very high lipophilicity. So it is almost insoluble in water. From the pharmaceutical point of view and considering the efficacy and safety of the drug, it is more common to develop dutasteride in soft gelatin capsules,” an official at GSK said. Theoretically, it is possible to develop it in small-size tablets. But to do so, you have to use additives such as surfactants and certain solvents, he added. Avodart used an excipient, guaranteed by the U.S. Food and Drug Administration as “generally recognized as safe,” in manufacturing Avodart, which was exceptional, the official said. 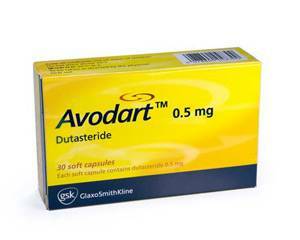 The GSK’s official also noted that dutasteride’s high lipophilicity raises the risk of drug absorption through the skin. “If the drug comes in a tablet, not in a soft capsule, touching dutasteride directly by hand could expose the powder of the drug to the patient, family or pregnant women. That could be a problem,” he said.